The first time you heard the name “Megan Ellison,” most likely, was when she saved The Master. Paul Thomas Anderson’s then-untitled project was on the ropes, Universal having dropped it after cringing at its $35 million budget. And then, wham, Ellison — the now 27-year-old daughter of Oracle founder Larry Ellison, the third richest man in America — swooped in, cut the check, and made Joaquin Phoenix’s quivering-arm-on-hip move a national phenomenon (OK, no, not really. But there’s still time!) And quickly, a rep was born: Ellison was flush with cash and willing to spend it, straight up, on stuff she liked, thorny projects from prestige names that just weren’t getting the studio money they used to. That mentality has translated into a couple of solid flicks (Killing Them Softly, Lawless) and one big screaming winner: Kathryn Bigelow’s Zero Dark Thirty, which bears Ellison’s Annapurna Pictures imprint. Now, with ZDT barging into the Oscars, Vanity Fair has gone ahead and profiled the young Ms. Ellison. And while she didn’t actually sit down to talk about herself, luckily, lots of other people did. So what’d we learn? Her dad’s really good at birthdays. “In 2011, on her 25th birthday, she received from her father what a source says was $200 million, with similar sums soon to come. (The Wrap’s Sharon Waxman has reported a figure that is more often whispered about in town: a lump sum of $2 billion. Ellison’s spokesperson says neither figure is correct. )” Meanwhile, my own sources tell me all that cash is just an attempt to cover up for the epic screw-up that was Megan’s 24th birthday, when all her pops got her was an oversized foam-finger, a half-full bag of Gushers, and a gift certificate to Claire’s. She’s BFF with ZDT’s Jessica Chastain. According to VF, Ellison “was instrumental in Chastain’s casting, texting her after an unreturned phone call, ‘If I ever ask you for anything in my life, it’s to call me back for five minutes. 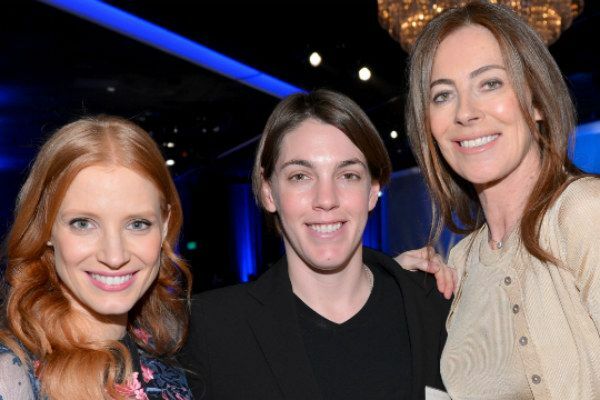 '” Chastain: “I said, ‘That’s very dramatic, what is it you need, missy.’ And Megan said, ‘O.K., we have this film, and Kathryn Bigelow wants you. We went to your agent and were told you are busy. I cannot accept that for an answer. '” Then, during the actual shoot: “We’d order food, pig out, watch Game of Thrones together, and relax.” Also, according to an anonymous source: “Megan is obsessed with Jessica.” Ehh, “Best friends with,” “obsessed with” — what really is the difference? Megan’s not mad at the fashion choices of the 1990s. “[S]he has a slacker vibe. She drives a gray ’89 Aston Martin or rides one of her motorcycles, often has a Camel cigarette in hand, and rarely wears makeup. Partial to butch, grunge chic, she usually wears a uniform of army boots, denim jeans, and a hoodie pulled over the T-shirt of an old-school rock band, like Led Zeppelin or AC/DC.” Which might all be part of the ruse. Says one industry veteran: “Something strikes me as high school about Megan’s approach .. she’s funding movies of the cool kids to hang out with the cool kids. With the hoodies and the attitude, it feels too studied.” Meaning? Megan Ellison doesn’t wear regular hoodies: Megan Ellison wears studied, symbolic power hoodies. Even though she’s now famous enough to warrant a Vanity Fair profile, it’s maybe not been the best year for her overall. The first big splash she made, funding The Master, maybe hasn’t turned out so well: “It’s thought that Ellison has lost as much as $20 million on the project — although she disputes the figure.” The rumors are that she’s not going to be as spendthrift in the future, and possibly not as artist-first hands-off either. Meanwhile, though, there’s lots of prestige projects in the works, including Bennett Miller’s Foxcatcher; the new Spike Jonze and Charlie Kaufman joint; and a new David O. Russell film. She’s got a beef with Harvey Weinstein, with whom she’s collaborated a couple of times already. VF’s sources say Harvey calculatingly blame-shifted The Master’s box office underperformance onto Megan, telling her it was her fault the talent didn’t do more press, and then “tortur[ing] her about it.” On Killing Them Softly, they quibbled over a cut and a release date, and she has reportedly vowed to never work with the dude again. And, with a strange amount of exactitude, one source explains that Harvey’s “brought Megan to tears four or five times.” Which is probably the best sign that she’s really made it in the biz: Who in L.A. has Harvey Weinstein not made cry?